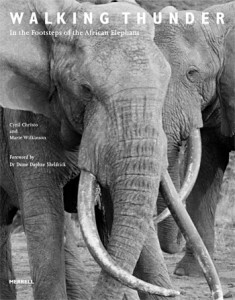 WALKING THUNDER: In the Footsteps of the African Elephant is the first black and white book of its kind dedicated entirely to a single species in the wild. The African elephant is one of the most majestic creatures on Earth, yet it faces an uncertain future. Walking Thunder is a superb tribute to the remarkable beauty of these endangered creatures. Striking duotone images by award-winning photographers Cyril Christo and Marie Wilkinson capture not only the awesome strength and size of the African elephant, but also its gentleness and human-like emotions. Accompanying the photographs are quotations, myths and stories from the past 400 years, from folklore and from explorers and tribal members, presenting both Western and indigenous perspectives. At once entrancing and thought-provoking, this is the perfect book for anyone passionate about the conservation of our planet. Christo and Wilkinson capture the gentle, imposing nature of these animals against the stunning backdrops of their plains environment. Big, bold, black & white double-page spreads are as arresting as the creatures themselves and draw you into their world. This is more than a wildlife book; it’s documentary photography at its finest. Cyril Christo and Marie Wilkinson’s stunning images highlight the luminous beauty of Africa’s elephants, says Ruth Styles, and show why ending the ivory trade is more important than ever. With only 450,000 individuals left in the wild but with an Asian appetite for ivory that is showing no signs of abating, the future looks bleak for the most magnificent of mammals, and Walking Thunder sets out to show us exactly what we stand to lose. The photography and text filling the pages of In Predatory Light: Lions and Tigers and Polar Bears (Merrell, 2013) haunt like the dissolving edges of a gripping dream.